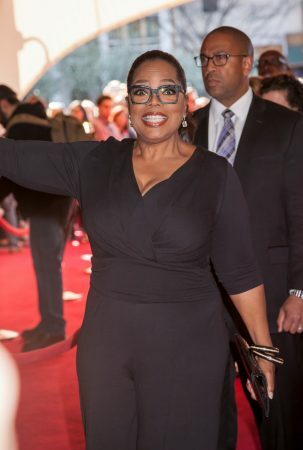 Oprah looks tall and statuesque at the premiere of OWN's 'Greenleaf' in West Hollywood, California. 06/16/2016. Credit: @Parisa / Splash News. The Oprah Winfrey Weight Watchers partnership has been ongoing since 2015, with the media mogul acting as co-owner and endorser. The Oprah Winfrey weight-gain battle has been a public one for decades; her weight has fluctuated considerably over the years. Now she appears to be in a good place health-wise and she credits this to having a weight-loss buddy, Stedman Graham, who is also her life partner. Winfrey shares that it’s always easier for her to adhere to a weight-loss regimen when others are on board, counting points with her as part of the Weight Watchers program. She also says that the two of them hold each other accountable. She has lost a reported 30 pounds since beginning the Oprah Winfrey diet and exercise program. 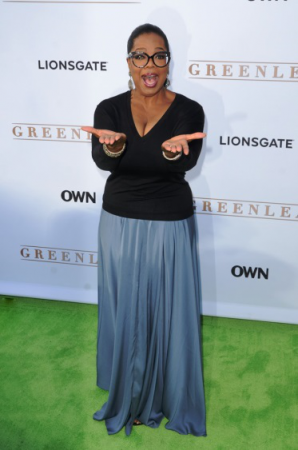 Oprah looks tall and statuesque at the premiere of OWN’s ‘Greenleaf’ in West Hollywood, California. 06/16/2016. Credit: @Parisa / Splash News. 1.Embrace Fish and Seafood: The Oprah Winfrey diet menu is heavy on barramundi, or Asian sea bass, which is her new favorite fish. But because it is sometimes hard to find in the U.S., she substitutes with cod. She also enjoys salmon and Chilean sea bass. She recently discovered that 77 large shrimp are equivalent to just six Weight Watcher points! 2.Try Jicama: Winfrey is known to love a crunchy snack, which used to mean she would eat a whole bag of potato chips. Not anymore. There is a root veggie called jicama that is sweet and nutty and packs a huge crunch and she loves it! 3.Mix Spaghetti Squash with Real Noodles: For a more satisfying meal, tale about 3/8 of a cup (or two points worth) of your choice of noodles and mix it with spaghetti squash to make it more like real pasta. 4.Substitute Cauliflower for Potatoes: Did you know that Winfrey makes cauliflower mashed potatoes because it is healthier than regular potatoes and it has less points value? Yes, and a little secret is that when she has company over, she adds one potato to the mix to make it rich. 5.Drink More Water: Like any nutritionist will say, increase your water intake to keep hydrated. Winfrey is not a huge fan of water but knows she should drink more because it’s so good for your body. Winfrey also says weight loss is not about a number on the scale for her—it’s about how she feels. When she suffers from some intense cravings, she takes a big, deep breath and reminds herself that she is present until they pass. It wasn’t until her 53rd year that Winfrey began struggling with weight issues yet again, but this time she received mail from fans suggesting she get her thyroid checked. Sure enough, Winfrey was diagnosed with hypothyroidism and felt pretty defeated. She then went on to say that her condition was cured…which wasn’t exactly true. The mogul really meant that she had been taken off all prescribed medication and her thyroid levels were balanced. It’s unclear what exactly was going on with Winfrey since her case was unique: she fluctuated between having an over- and under-active gland. Thyroid problems are extremely complex, but Winfrey figured out that a major part of her weight issue was emotional. She is a self-professed emotional eater and when she is working too hard and not taking enough time to play and relax, that’s when the bingeing really gets out of control. Her philosophy is finding balance. Winfrey is known to do cardiovascular and aerobic exercises with her trainer Bob Greene. Some of these include power walking, jogging, elliptical exercise, stair stepping, and rowing. She does these exercises six days per week. In addition, she also does a 20-minute cardio workout before dinner. On one day of the week, when she isn’t doing any strength training, Winfrey goes for a 75-minute run. She performs strength training four to five times per week, and the exercises include squats, leg extensions, leg curls, chest presses, incline presses, lat pulls, seated rows, back extensions, and chest standing flies. Winfrey is set to release a new cookbook entitled Food, Health and Happiness: “On Point” Recipes for Great Meals and a Better Life in January 2017. She was inspired to write the cookbook, which is full of the top Oprah Winfrey healthy recipes, after losing weight with the help of Weight Watchers and getting feedback from friends. Winfrey has healthy meals prepared at home for her guests and they always ask her how such healthy recipes can taste so good, hence her cookbook was born. Winfrey also contributed to Rosie Daley’s cookbook, In the Kitchen with Rosie: Oprah’s Favorite Recipes, in 1994 and wrote an introduction to O, The Oprah Magazine Cookbook, which came out in 2008. 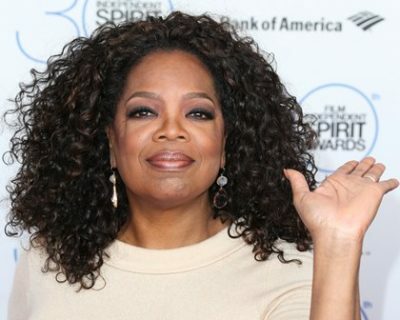 Some of Oprah’s favorite recipes throughout her years on The Oprah Winfrey Show have included: Mar-a-Lago Turkey Burgers, Mar-a-Lago Key Lime Pie, Tom Cruise’s Spaghetti Carbonara, Jamie Oliver’s Funky Spaghetti, Rachael Ray’s Spanish Ham Panini, Rachael Ray’s Caprese on a Stick, Paula Deen’s Grandmother’s Pound Cake, and Tim McGraw’s Chicken and Dumplings. These can all be found on her web site, along with the top Oprah Winfrey chicken recipes and much more. Winfrey has had a succession of TV shows throughout her career. 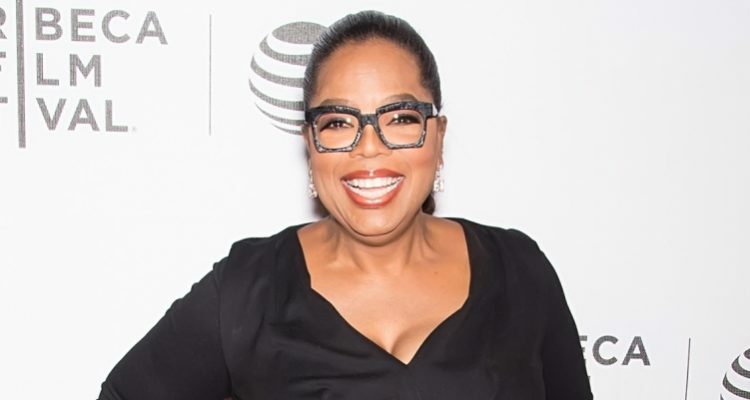 Since launching her very first network, OWN, Winfrey has added plenty of shows to her resumé including Oprah: Where Are They Now, Oprah’s Master Class, Oprah’s Lifeclass, and SuperSoul Sunday. And, of course, we can’t forget The Oprah Winfrey Show and The Best of the Oprah Winfrey Show. Her most recent endeavour is a show entitled Greenleaf, a 2016 TV entry that began airing in June. Winfrey’s OWN network features scripted television, including a dramatic new series called Greenleaf, which Winfrey stars in. Greenleaf is a soap opera that revolves around a daughter’s return to her family’s Memphis megachurch empire. Cast members include Keith David and Lynn Whitfield. It is said to be similar to the popular TV drama Empire, with less violence and more morality. The show raked incredible ratings—over three million viewers—from women aged 25 to 54. It is written by Craig Wright and executive produced by Winfrey and Clement Virgo. You can catch it on Wednesday nights at 10 p.m.
Respers France, L., “Oprah Winfrey’s weight loss secret,” CNN web site, June 3, 2016; http://edition.cnn.com/2016/06/03/entertainment/oprah-winfrey-weight-loss/, last accessed August 16, 2016. Greene, B., “Oprah’s Weight Loss Confession,” Oprah web site; http://www.oprah.com/health/oprahs-weight-loss-confession, last accessed August 16, 2016.